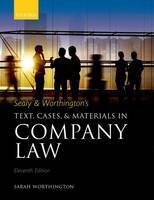 Sealy & Worthington's Text, Cases, & Materials in Company Law clearly explains the fundamental structure of company law and provides a concise exploration of each different aspect of the subject. The materials are carefully selected and well supported by commentary so that the logic of the doctrinal or legal argument is unambiguously shown. Notes and questions appear periodically throughout the text to provoke ongoing analysis and debate and enable students to test their understanding of the issues as the topics unfold. This text covers a wide range of sources and provides intelligent and thought provoking commentary in a succinct format. It will be invaluable to all those looking for expert observations and vital materials on company law.